Hello and welcome this this site, a place for tips and information related to things technical but presented as non technical as possible. A sharing of ideas and projects that hopefully will benefit many of you. I have also been developing free software for a while and have dedicated a lot of this website to that endeavor. Software information, screenshot photos and downloads are readily available. Check the Software Photo Gallery for screen shots of the programs. Blog articles on my Free Software and other tech stuff are here. This site and the Blog site are new and are being worked on as my old site is currently not accessible. Feel free to download and comment on any of the programs. Nov. 10th 2018 - Version 3.14 of Ready Bible Study is now available. Quick access to program commands is increased through the addition of the Quick Command Bar and the Full Commands Window. The Blog page is here. Sept. 8th 2018 - Version 1.33 of InfoWarp has been uploaded. This is a multi purpose launcher with added text/notes database and hotstring launch features. Small, fast and all business. The Blog page is here. Updated 6/30/18 - Relevant Notes v1.15 has been added to the blog site. It is a sticky notes program that only displays one note at a time, attached to files, folders or websites of your choosing. This allows for relevant notes to be entered for items you need to track work on. Check out pictures in the Photo Gallery. Blog page is here. Christmas 2017, Ready Bible Study. I blended in most of the functionality of Constant WORD and Bible Promises into version 2.90. Blog page is here. Oct 29th - As an offshoot of Constant WORD, I used similar programming to create Constant Info, a program that can serve as a daily reminder or be used in workgroups to alert of important issues or hot topics. It uses a number system from 0 to 5 to color code each info item. It can also use dates to determine how long and when items appear onscreen. It's blog page is here. Oct 4th - For those who enjoy reading the Bible, you can use a new application called Constant WORD. It displays up to 2,500 items from Popular Bible verses, Bible Trivia and quotes from Christian authors, pastors, speakers. It only uses one line of scrolling text that can be placed in six areas of your main monitor. Randomly, text items are scrolled across this area constantly. Blog page is here. Sept 4th - A new program to help automate switching between applications, documents, folders and web pages called Shortcuts Creator is available on its Blog page here. A new program that assists users in choosing safe, stronger passwords is called Password Helper and is available from the its Blog page here. For a program to quickly search for predefined Office 365 and other documents, try Data File Search and Copy. You can do a fast search of the whole C drive or just the current user's profile folders. The Blog page is here. A new application for download is called Bible Promises and is based on a popular promise book. It also includes a daily devotional plus daily New Testament and Psalms/Proverbs readings. The New Testament is also available for reference. The Blog page is here. Updated 6/30/18 v1.36 Multi-Launcher whose Blog page is here. 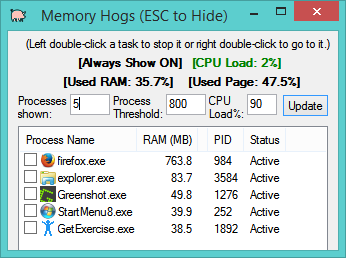 Version 1.44 of Memory Hogs is now available with a number of additions including a left click menu and a couple of fixes. Blog page is here. Version 1.74 of Get Exercise is now available with an all new Exercise Dashboard, Stretching timers, 1-Minute exercise timer and Pomodoro Work/Break timers. Blog page is here. I hope to add more reference materials to Ready Bible Study in the next month. All of these programs are written with the AutoHotkey script language. How to get a free AutoHotkey book. While Windows does a pretty good job of helping you to categorize and search your files, sometimes it is handy to expand that search to the entire hard drive. With this program you can search quickly and display a list of matching files. From there you can further search and also copy files or folders to another location. For those who desire an ultralight Bible application, they should try Bible Promises. It contains verses grouped by God's promises, a daily devotional, daily readings of New Testament, Psalms and Proverbs. I general Bible reader is also included. And all text can be played via audio by pressing the F6 key. For beginner and experienced readers of the Holy Bible. Easy answers to common questions, general Bible study, daily Readings and Devotionals. EVERYTHING can be played through Audio on your computer. Daily readings and devotionals can be queued up for easy listening. v2.70 - added more control over window and text background colors. Exercise Reminder for office / IT workers who sit at computers many hours per day. 1) When any process uses more than a certain amount of RAM. 2) When any process is ‘Not Responding’ a Tray Tip window will be displayed. 3) When the CPU Load is over a certain percentage. 4) When free Disk space is below a certain amount. 5) When Used RAM is above a certain percentage. 6) When Used Pagefile is above a certain percentage. 7) Monitors processes that use one or more windows, not window-less processes. It can run in Stealth Mode and log these events for you to check later on. For those who wish to modify it for themselves. For people who predominantly use one eye while reading, this program periodically displays a small prompt to switch from Left to Right eye after a user chosen number of mouse clicks. It can be customized by font, size, display time, etc. For multiple monitor users, it can be set to use one eye for each monitor. In Clicks Only mode, after 5 minutes of no clicks, the prompt to switch eyes will be displayed at twice size, centered with audio. I have only tested multi monitor support with three monitors at work. You can also set a simple Timer Only mode where the program alternates between Eyes after x number of minutes. v1.26 adds Timer Only Audio mode where only sounds are used to let users know when to switch eyes.